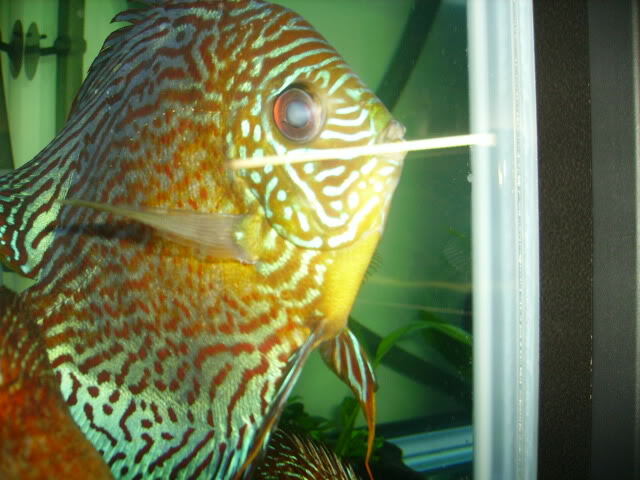 Symptom: White film on discus eyes. Treatment: Perform large water changes for 3-4 consecutive days until white film is gone. Cloudy eye on discus is a common fungus that is caused by poor water quality. You will notice that one or both of the eyes have a white cloudy film over them. Cloudy eye is often mistaken with discus pop eye. When a fish has discus cloudy eye there eyes only become cloudy but they do not seem to protrude from the head like pop-eye. The treatment for discus cloudy eye is very simple. Perform large water changes at least 50% for 3-4 consecutive days until the white film is gone.